C recently finished saving up for his Nintendo DSi (see Day 18 and Day 19 from way back in September), and apparently it is necessary to have multiple styluses (styli?) so that you can change colors and lose them and things. 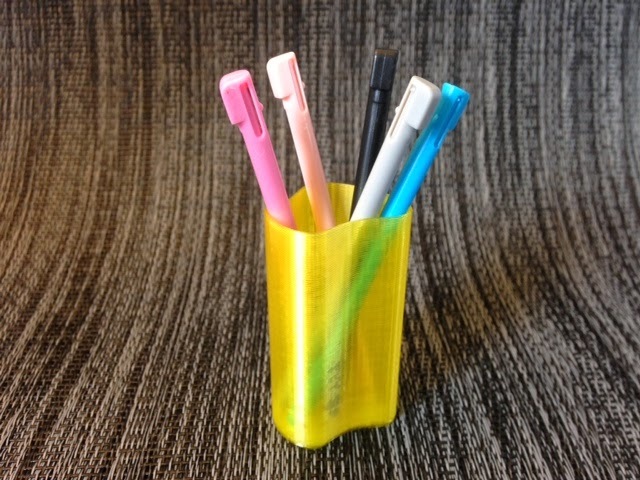 Today we printed a small holder for them, designed in Tinkercad with their wonderful new "Extrusion" Shape Generator. Settings: MakerWare custom profile to get a base and 2-layer sides but no top, in just a couple of minutes. Details on the profile are below. Technical notes, Tinkercad flavor: The new "Extrusion" Shape Generator allows you to change the outline of a cylinder with a four-anchor Bezier curve. This is the first time it has been possible in Tinkercad to stretch a shape around by anchors and their tangent lines! Perhaps in the future we can get more handles and/or the ability to do this right on the workplane, add or remove handles, etc etc. This is a great step in the right direction for Tinkercad. Tinkercad also added a Ring Shape Generator and three types of Text, as they explain in this blog post.